I went for a ride. That might not seem an especially remarkable thing, especially for someone who writes a some-time bicycle blog. But in fact, it is an extremely rare event. Since the junior Chillikebabs came along, I almost never just ‘go for a ride’. I mean, I ride my bicycle a lot. I go to work, to the shops, take the kids places. There’s rarely a day when I don’t ride somewhere. But the whole business of just going for a ride for fun just rarely seems to happen. That’s not a ‘woe is me’ comment; some kind of misogynist male-entitled rant about how wives and kids ruin your life. Far from it – if I wanted to go for more rides, there’s nothing (much) stopping me. Rather it’s just that there’s lots of other things I’d rather do. Like staying in bed, for example. And playing with the kids. After all, I didn’t become a father just to abandon them every Sunday morning so I could ride my bike. So I suppose what having a family taught me was that I wasn’t really that fussed about going for a bike ride. My transformation from leisure rider to utility rider is pretty much complete. Anyway, I did go for a ride the other day. 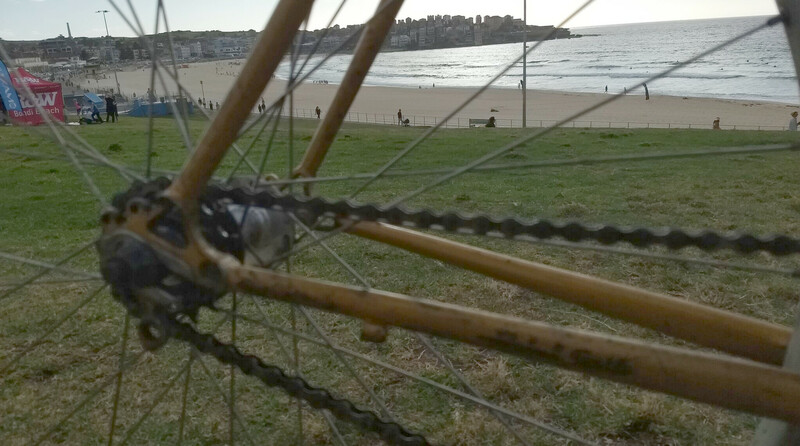 I pootled out to Bondi Beach, nurdled around Centennial Park and generally rode around aimlessly. It just so happened that the day I chose for my ride was the day of the Sydney Spring Cycle, so I kept getting caught up in road closures, police patrols and hundreds of people riding along. Which was sort of fantastic, and also sort of frustrating. I kept trying to get away, and everywhere I rode, there is was again! Oh, and I found a piano on Oxford Street. So I stopped and played it for a bit. Try doing that when you’re driving a car. There are so many amazing opportunities that happen because you’re on a bike. Cool entry, when my kids were born I spent twenty five years going to soccer practice and eating at McDonalds. Now they are gone and I’m trying to get my cycling back – the only problem is that the engine is now all old and worn out.